�On two occasions I had been charged by a tiger. When people hear this, the immediate reaction is �Wow�. Immediately, they feel jealous. Unfortunately, that is the reaction of people. People don�t realise that as a rule, a tiger or for that matter any wild animal will not charge, unless and until it is forced to. 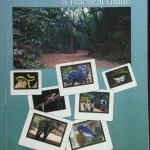 There is a fight to flight distance for the wild animals. The wildlife would maintain a minimum distance from people. They are likely to runaway when this distance is breached. Mostly, they flee towards deeper forests. If you happen to startle a wild animal by somehow managing to suddenly approach very close to them, and if they perceive you to be blocking their path, then you are most likely to be attacked. Most of the times, it is a mock charge. The intention is to scare you. Last year, I bumped into a wild tusker before dawn in a narrow winding road in BR Hills. It showed its irritation by trumpeting and then came charging towards me. I had to reverse for about 15-20 meters before the elephant decided that it was enough. Most of the times when a wild animal attacks a human being, the incident can be explained. I had been charged once by an adult male tiger and on another occasion by a tigress. And I must confess that on both the occasions I will give a clean chit to the tiger and tigress involved. It was a warm morning in Bandhavgarh National Park, in the summer of 2005. 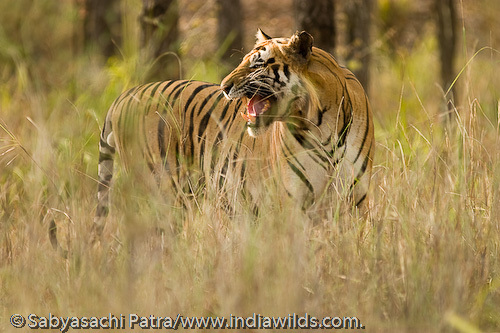 I was tracking the Rajbehera Male, the predominant male tiger in the Rajbehera area through pug marks and alarm calls. The tiger was aware of my presence. It was using a game trail, and I had prefocussed my camera to that point. However, the tiger emerged from the game trail and bounded into the bushes on the opposite side of the road. It happened within a fraction of a second, and I knew that perhaps there is a reason for this tiger to avoid human beings. My driver � Ram Shankar, told me that it was the Rajbehera male and it generally avoids people. We then quickly reached the Rajbehera grasslands, as the tiger had to cross the hill and pass through the Rajbehera grasslands. When I reached the Rajbehera grasslands, I found another jeep with two French tourists. I was waiting for about twenty minutes before the tiger appeared at a distance on my left. The other jeep was in front of my jeep. When the tiger tried to cross the road, the other jeep driver moved the jeep ahead and positioned it in front of the tiger. 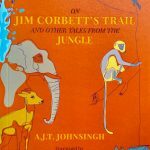 The tiger was about forty to fifty feet away, but sat down near a bush when it realized that the jeep is trying to block its path. I told the other jeep driver and guide that we should not be blocking the path. My driver, Rama Shankar, infact warned them that this tiger gets very annoyed with people and attacks the jeep if some one blocks its path. So we decided to move about fifty meters ahead and leave a space between the two jeeps, so that the tiger can pass. After some time, I realised that though the tiger was trying to cross in front of my jeep, it was coming straight in our direction. I had rested my lens on the side seat of the open jeep and was shooting. Rama Shankar – my driver – was afraid of this tiger, due to its past reputation and also the manner in which it was growling. He suddenly decided to move the vehicle ahead, when the tiger was about twenty feet away from us. The moment he started the engine, the tiger charged. I lost my balance and fell on the jeep floor. I could just see that the tiger and our vehicle were running parallel to each other with the tiger’s head turned towards us and he was continually growling. And suddenly our vehicle slowed down and the tiger crossed in front of us. The charge happened at a split second and was over perhaps within a minute. 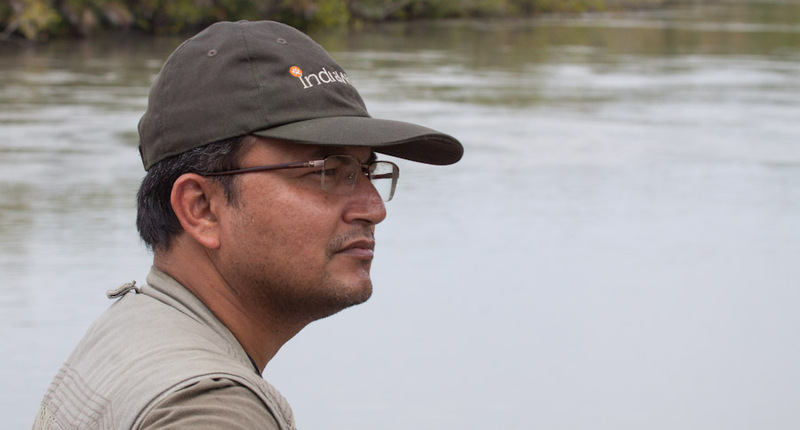 The guide was shaking, and Rama Shankar was speechless. I was really annoyed with him, as he started the vehicle without my instructions. However, it was not the fault of the tiger. People try to block the path of the tiger – and tiger being a gentleman � sits down and waits for people to pass. This helps people to click a few shots. Most of the drivers do this to impress their foreign clients as they get substantial tips after such an incident. The second incident happened exactly after a year in 2006. 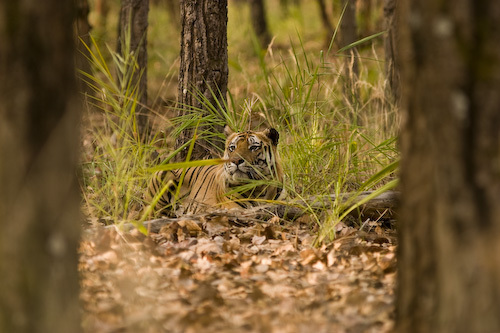 It was summer again in Bandhavgarh National Park. However, this time the aggrieved party was a tigress. It was early in the morning. My vehicle was the first to enter as soon as the forest gates opened. At Siddha Baba, I found a jungle cat and stopped to shoot. Couple of vehicles following me, passed comments that �Ohhh! It�s only a cat� and moved ahead. 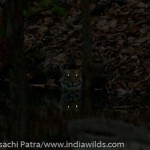 Within a few meters they found the Chakradhara female and her four cubs. The jungle cat had by that time vanished and I had reached the Chakradhara trifurcation. The tigress and the cubs were crossing over from the Siddhababa side to the chakradhara grasslands. On my right was the hillock and on the left was the grassland. By the time I reached the place, several jeeps had crowded the place. The tigress had crossed and was hiding behind the tall grass. The cubs about 13-14 months old were crossing over one by one but were being disturbed by the vehicles. I asked the driver to leave the cubs and move the vehicle back to the spot where the tigress was hiding. Since, I arrived late on the scene; I had no idea as to whether it was the tigress or one of her cubs. I was standing on the seat of the open Gypsy, and was trying to see through the tall elephant grass. The bush where the tigress was hiding was about twenty feet away from me. 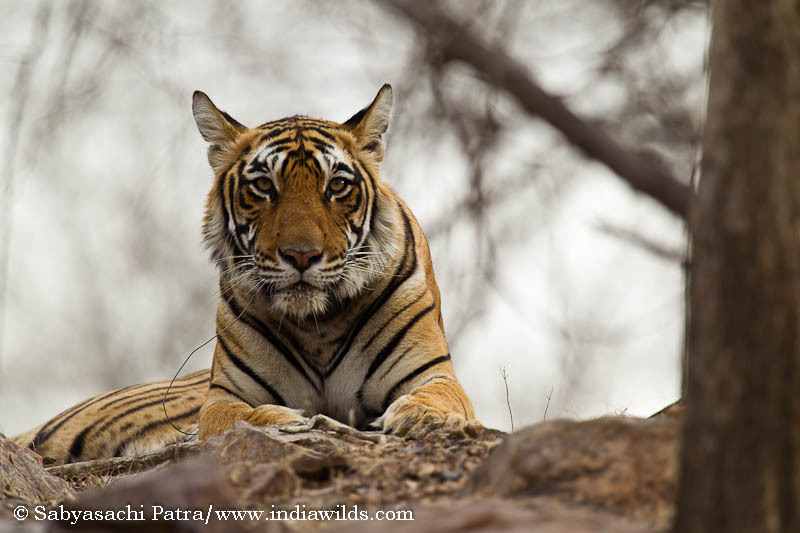 Within minutes, the tigress charged with a series of short roars. The moment the grass parted to make way for the tigress, I tried to focus my camera. However, within a split second the tigress stopped in front of me, growled and turned back into the tall grass. All the noise from the other vehicles had stopped. A business man was with me along with his wife and kid. They were shaken to the core. I heaved a sigh of relief and when I looked down at the bottom of my trousers, it was moist with the spit of the tigress. I touched it with my left hand and then settled down in the seat. I knew I won�t be closer than this to a tiger. Later on when I looked at the shots closely I could see the faint outline of the curled up upper lips indicating that the tigress was snarling before it charged. Normally, the tail of the tiger twitches rapidly when it is about to charge. In this incident, I could neither see the tail, nor see the tiger snarling. Infact, had I known that it was the mother, I would not have moved close to it. If you come between the mother and child, of any species, there are bound to be repercussions. Hence forth, I always take time to ascertain whether I have inadvertently separated a tigress and cubs or elephant from its cubs etc. I have seen people shaken up, drop their binocular, camera or whatever they were holding and even have found people who could not sleep for couple of days after an wildlife encounter. This year in Bandhavgarh, in the Rajbehera Grasslands, a tigress mock charged at one of the open jeeps lined up on the road to catch a glimpse of the tigress. The gentleman was cowering under the seat of the gypsy and was screaming that he has died and that the driver should inform his family etc. However, we should remember that these encounters are not only stressful for us, but it is very stressful for the animal as well. In such situations, the adrenalin flow increases and some species like deers are known to die. In one of the incidents, in Keoladeo-Ghana bird sanctuary in Bharatpur, the wall had broken and the deers had come out and were grazing in the surrounding fields. This bird sanctuary is small, about 26 acres and concrete walls have been erected to separate it from the surrounding fields. The forest department officials rounded up all the deers, caught them and transported them back to the sanctuary. About forty deers (Axis axis) were reported to have died due to shock. I�am writing this to say that tiger won�t charge or growl without provocation. Most of the photographers try to incite the tiger to get a growling shot. Please remember that no shot is more important than the welfare of the subject. We should not induce stress on them. And a word of caution as well. These wildlife encounters have the potential to turn fatal very easily. Remember, we human beings don�t have any physical defences against a 250-350 kg tiger or a 2 tonne gaur or a 5-6 tonne elephant. A cursory glance at the powerful forearms of a tiger cub will make you realize the power they possess. In one of the incidents in Ranthambhore National Park, a National Geographic photographer though he was seated on an open jeep, had placed his tripod on the road. Two tiger cubs about 10 to 11moths old- inquisitive by nature as they are � came closer to investigate. The photographer could remove the camera and lens from the tripod, just in time to see the cubs start playing with the heavy tripod. In no time, the tripod was twisted like a plastic wire. We should understand the behaviour of the species we are photographing. If an animal is going to charge at you, then you can get vital clues and those precious seconds to escape. At times, it can be the difference between life and death. And please understand that you are not only risking your life, but also leading to endangering the life of the animal. If a tiger mauls a reckless person or if a tusker tramples someone, the animal is more likely to be either shot or caught and imprisoned in our zoos for life. 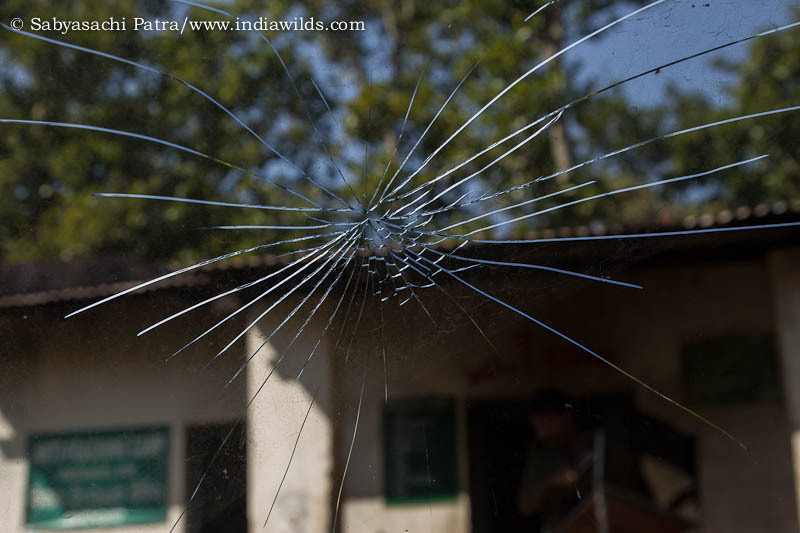 In one of the incidents, an adolescent tiger in Bandhavgarh National Park had killed a cow. Normally, adolescent tiger after separation from their mother has to establish a territory of its own. To avoid conflict with the established mature tigers, these young tigers are pushed to the periphery and frequently come into conflict with the villagers. In this instant, the tiger killed the cattle and was resting close to it, when a fifteen year old boy while searching for the cattle bumped into the tiger. Obviously, the poor kid was killed. The park authorities then declared the tiger as man-eater and then caught and sent it to Bhopal Zoo. Within four days the tiger was dead. 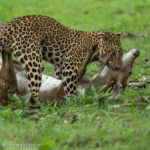 I hope that this tale would help our fellow photographers to realise the importance of understanding animal behaviour so that they exercise enough caution to avoid wildlife encounters. I think there should be mechanism to check this type of practice. Those found guilty should be fined and should be asked to leave the park immediately. I am happy that you took the time to read my blog and vote for it in Indiblogger. I am also impressed by your passion for wildlife . Very few people choose that, and write about it so well. I would read more of your posts on wildlife, and get a glimpse of what I am ignorant about. I am happy that you liked my writing. I am happy that you liked my images. I am trying to educate people, however, we have a lot more people (1.2 billion population) than I can handle. We need more champions who can raise awareness. Nice to read about your adventures. Thank you for educating us about shooting in the wild. Nice to know that you are concerned about your subjects. Superb pictures, btw. I do wish people would leave wild life alone & not trespass in what is their property..this is an awesome post though..& I find it extremely funny that posts like this only get a few readers..when people are so gaga about posts that make fun of politicians and generally drip in sarcasm…nature unfortunately has few takers. I agree with you that nature has a few takers. I remember running after those butterflies and watching the colourful birds. Today, with people mostly living in apartment blocks, how many kids get to watch butterflies? We are being disconnected from nature. The question of tresspass cannot be dismissed. In the forest, the right of way is that of animals. It is their place. 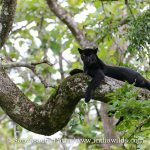 When we go to forests for scientific pursuits, serious documentation, or plain relaxation, we should always remember the fact that the forest is the home of the wildlife. The word tresspasser may hurt us, however, we should remember that we don’t own the earth. Very well written article. People should understand that the animals is wild are very different from what they are accustomed to in zoos.